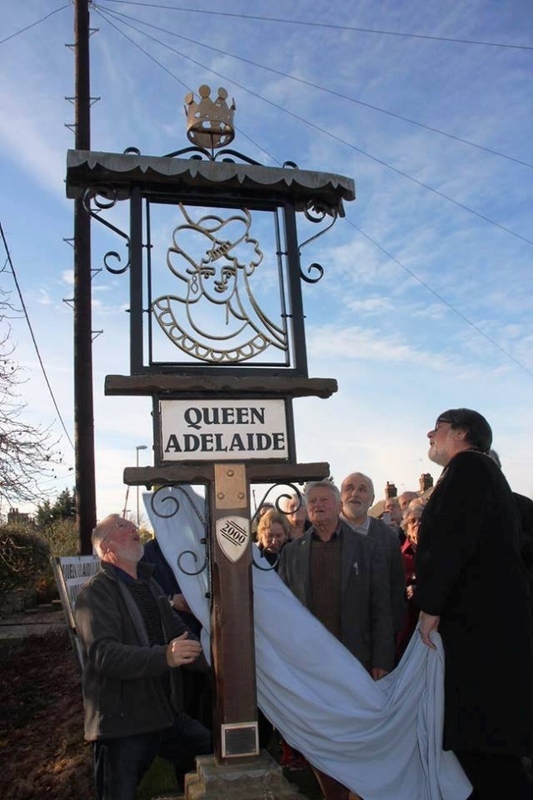 Queen Adelaide is a hamlet on the River Great Ouse in the Fens about 1 1⁄2 miles (2.4 km) northeast of Ely, Cambridgeshire. The hamlet is named after a pub, which in turn was named after Queen Adelaide, consort of King William IV. The hamlet did not exist until the 19th century, when the railways reached Ely and the pub was built. In October the old wooden sign was taken down as it was looking very worn and repainting was not considered to be good enough fix. Stuart Green of Queen Adelaide designed the project while his nearby neighbour metalworker Brian Acred fabricated it. Services within the village are very limited with a car garage, a village hall, a public telephone and a bus service only one day a week.